It began with an advertisement in 1824 in the Perth Courier. “Burt’s Close, 129 High Street or 19 Mill Street. J Pullar respectfully intimates that he has commenced business in the above situation, where he carries on the dying in all its branches. Crapes, Silks, Velvets, Poplins and Bombazeens dyed and dressed on the most approved principles. British and Foreign Shawls and Scarfs cleaned without injuring the most delicate colours. Chip, Straw and Leghorn Hats dyed and dressed, Cloths dried, and Furniture of all kinds cleaned and renewed; Crumb Cloths and all sorts of carpeting and Hearth Rugs cleaned and renovated to look like new. In spite of the up-beat advertisement, success did not come too easily. John Pullar’s neighbours in Burt’s Close complained of the “nuisance” of his dyeing and he was forced to move. He settled on a piece of ground near to the remains of Black Friars Monastery where he had the additional advantage of being near to the lade - a good supply of water being essential. Twenty years later, John’s son Robert joined his father in partnership. He had already several years experience of the dyeing trade, but in addition to his expertise he also brought a new drive to expand the business. He secured agents in the small towns outwith Perth, and with the reduction on parcel post rates from 3/6 to 1/9 it became possible to look even further afield. In 1852 he was awarded the Royal Warrant - Dyer to Her Majesty the Queen. The increased business brought about by the award resulted in the purchase of a whole range of machines and an increased workforce which reached almost 100. Large numbers of sewing machines were purchased from America for the finishers. In 1866 over 1,000 people visited an exhibition in the City Hall to demonstrate some of the latest developments at Pullars, together with a model of the latest extension in Kinnoull Street. In 1878 John Pullar died. Four years later, his son Robert bought the 112 acre premises of Tulloch Bleach works which had come up for sale. He cleared the site and built a new modern factory. Parcel post rates were again reduced which helped to open up the English market. There were receiving offices in a number of different towns including Brighton, Bath, Liverpool, Manchester and Newcastle. London had no less than three offices. All these had their own distribution vans and kept in touch by phone with the factory in Perth. The North British Dyeworks at Tulloch now employed around 1,900 people. There were a number of recreational clubs for the workers, all subscribed by the firm. Holidays with pay were given for special occasions. The workers were paid well above the local average wages, safety standards were the best in the industry, jobs were secure but though the future looked rosy there were troubles ahead. At the end of 1890 there was a rail strike which seriously disrupted the trade to London and the south, demonstrating the vulnerability of the firm to transport dislocation. There was also a trade union threat looming on the horizon, though Pullars with “the best wages in Perth” could afford to maintain an attitude of superior hostility. The size of the workforce continued to increase; 2,600 by the turn of the century, with 300 branches and 4,000 agencies. By this time, though Robert Pullar remained as chairman, the management of the firm was in the hands of his son, Rufus Daniell Pullar, probably the most professional and knowledgeable dyer of all the family. But in the future it was not so much technological skills that would be needed as the skills of management. Unfortunately all the Pullar family were still wedded to Victorian paternalism. In 1907 there was a wage demand from the girls of the Ironing Department. The reply from the management stressed the job security and the long-term advantages of working for the firm. These advantages were, of course, real and substantial; women with 24 years service were entitled to an automatic week’s holiday with pay every year; with 33 year’s service a guaranteed minimum of 75/- per month, and all workers were paid for a 45 hour week whether they worked that or not. But the demand from the girls had stressed that 11/- per week was “not a living wage.” This problem was not addressed by the management. In addition to unrest in the workforce there were long term problems affecting the whole works. A very large part of their business was in the south of England and particularly in London. A rail strike had already shown how vulnerable these lines of communication were. But in addition they were in direct competition with some 600 firms in London itself. Neither workers nor management appeared to be fully aware of the threat this posed. With the rise in the Labour Party and the Trade Unions in Perth, it was obvious that labour troubles were likely to continue. In 1911 food prices rose dramatically and there were further attempts to raise wages. There was a short strike that soon collapsed. Unrest continued and B.D.Pullar, believing perhaps that this was a time to teach the Trade Unions a lesson, dismissed some twenty seven workers of whom all but one were Trade Unionists and most were leaders of the recent strike. 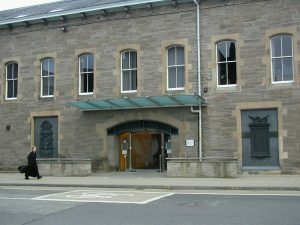 The Perthshire Advertiser commented, “A feeling of fear pervades the Works.” Pullars circulated a petition of Loyalty to the firm which they invited workers to sign. Even under such pressure 14% refused. The management insisted that they were not against the Trade Unions but their actions showed otherwise and more importantly they had succeeded in eroding the old feelings of trust between management and workforce. The outbreak of war in 1914 brought new problems. Many of the younger men left for France leaving an ageing or unfit workforce. Aniline dyes could no longer be obtained from Germany and substitutes had to be obtained from local herbs, lichens and mosses. The cost of living rose sharply and the wages did no keep pace. The firm protested that their own costs had risen and the volume of trade fallen but this was no consolation to the hard hit workers. Inflation continued to rise and in 1916 the Dyers Union demanded a rise of 10/- for dyers and 6/- for all other workers. The claim went to arbitration and the decision was given in favour of the Union. Though most firms accepted the result Pullars refused. Extra police were drafted in from Forfar and Dundee, but their presence failed to disperse the demonstrators or clear a way for the loyalists. Less than a hundred reported for work and even they left early. Next morning notices were posted on the gates. The statement was met with a chilly silence. There was very great reluctance in returning to work on the Wednesday though most workers eventually went through the gates. That very night, September 19th Rufus D Pullar died of “severe strain and pneumonia.” He was only fifty six. There was a feeling of great sadness, and perhaps also of guilt, among the workers, though A.E. Pullar had assured them earlier that the illness “was not linked to the strike troubles.” With hindsight, there seems little doubt that the protracted disputes contributed to his fatal collapse and had affected the whole Pullar family. It was the end of an empire. He hinted that negotiations were under way with another buyer but it was not until March of the following year that it was announced that Eastman and Son, Acton Vale, London had acquired a controlling interest in the firm. It would still be carried on under the name of J Pullar and Sons Ltd., Cleaners and Dyers, Perth. It is tempting to apportion blame between an old fashioned autocratic management and an extremely militant workforce. Could the firm have survived with better understanding on both sides? Probably, for the next few years, but in the long run geography was against them. They were too far from their main markets and it was bound to become increasingly difficult to compete in London and the south of England against local firms. For a firm and a family that had given so much service to the town and in enlightened Victorian management it was sad that they seemed completely unable to come to terms with the new conditions. At the very end, at least, both sides behaved with restraint and dignity.